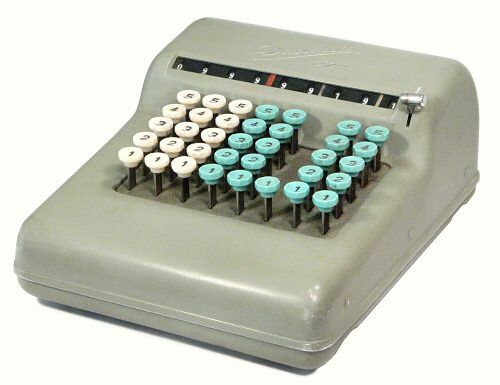 The key-driven calculator, of which the "Comptometer" is the definitive example, was the work-horse of business and commercial offices for almost eighty years. The term "key-driven" refers to a mechanism which is operated directly by the pressure of the operator's fingers on the keys. This direct and immediate operation distinguishes it from the more familiar "key-set" machine, in which the keyboard merely "sets up" a number to be used in a calculation - the actual calculating is performed in a separate operation by turning a handle, pulling a lever, or starting a motor. The key-driven machine completes the calculation in one operation instead of two, and is significantly faster in the hands of a trained operator. (Electric motors were added later to supply the motive power and provide a lighter touch, in the same manner as an electric typewriter. These machines are sometimes called "key-responsive" rather than "key-driven", but the principle of immediate operation is the same). The first successful prototype of a key-driven adding machine was built by a young mechanic named Dorr E. Felt in Chicago in 1885. He completed his first eight production machines in 1887, and secured financial backing from businessman Robert Tarrant. 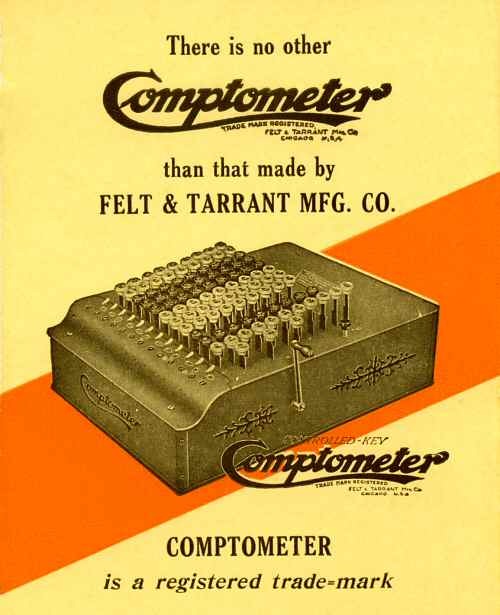 The Felt & Tarrant Manufacturing Company was established in 1889 to make and market the machines under the name "Comptometer". 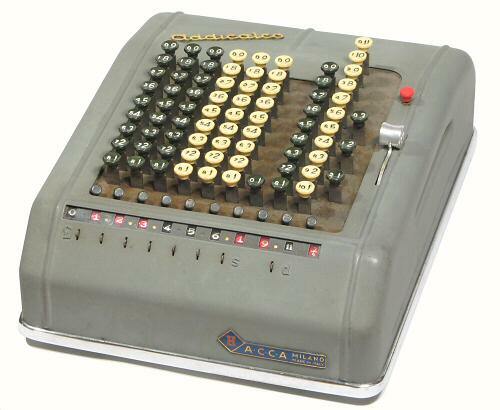 The Comptometer developed rapidly, and soon became standard equipment for high-speed calculations in most back-office accounting departments. The Burroughs company introduced a similar key-driven machine in 1912, and the Bell Punch Company in England developed a machine in the 1930s. The Bell Punch machines used an "abbreviated" or "half" keyboard with keys for 1 to 5 only, as it was found less tiring to strike (eg) the 4 key twice than to move one's whole arm to reach the 8 key. The Contex company in Denmark produced a range of low-cost half-keyboard machines during the 1950s and 60s. 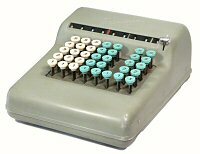 "Comptometer" soon became a generic term for any key-driven calculator, in spite of Felt & Tarrant's efforts to protect their trademark. The key-driven machine was capable of the full range of business calculations, but it required a skilled operator for anything beyond simple addition. Comptometer training schools were established in the US in 1905, and by the 1920s were producing 10,000 graduates per year. "Comptometrist" was initially an all-male profession (as was "typist"), but later became a popular occupation for a great many young ladies. 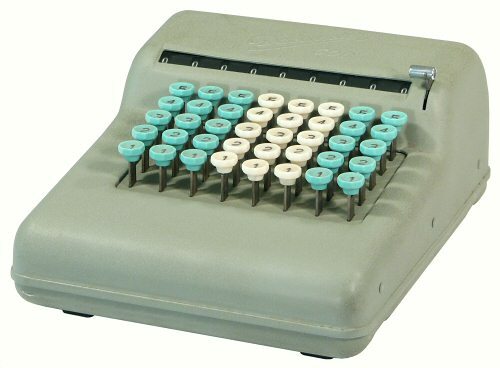 It disappeared in the 1970s as business accounting functions were taken over by low-cost electronic calculators, computers, and key-punch operators. Follow the links to separate pages describing the key-driven calculators from Felt & Tarrant, Burroughs, the Bell Punch Company, and Contex, or read on for machines from some of the smaller manufacturers. Be sure to visit the Operators pages for a glimpse of life as a Comptometrist. The Addicalco was built by the firm ACCA (loosely translated as "Adding, calculating, accounting, etc.") in Milan from 1946. The first machines were built using a set of tooling from Felt & Tarrant's superseded Model J Comptometer, presumably supplied as part of the post-war European reconstruction program. This Addicalco Model 53 is a 10-column machine for Sterling currency (with farthings), which is generally similar to the Model M Comptometer. It was imported and sold in Australia in competition with the Comptometer, but only in fairly small numbers. This machine has a leather carrying case that was custom-built by a firm in Melbourne. This Dacometer Model 508 is an all-metal half-keyboard adder for Sterling currency, probably from the 1950s or early 1960s. The nameplate lists the manufacturer as Rich. Muller of Copenhagen and the distributor as Dacorema. The company is known to have built a range of key-driven machines with full and half keyboards, in both bakelite and metal cases. A similar Dacometer Model 508 for decimal currency. The Speedee "Add-a-Matic" is a Japanese version of the Danish "Contex" machines. Although there is a British-looking coat of arms with the inscription "CM Inc, Chadwick" moulded into the top of the case, the base is clearly stamped "Made in Japan - Patent Pend". The fine print on the original box indicates that the machine was manufactured in Japan for Chadwick Miller Inc of Boston. The original owner has dated the machine "24/4/72". The mechanism of the "Add-a-Matic" is identical to the "Contex" in design, although cheapened somewhat in materials and construction.